Whatever your genre, or preferred medium, curling up and reading a good book is a wonderful way to spend your time. There are loads of genres to choose from – crime, romance, paranormal, Young Adult, New Adult, non-fiction, memoirs and literary fiction. All will sweep you away into the world created by the author and give you some much needed escape from reality time. A great place to get your reading material is at your local independent bookstore. If you don’t have one locally, there is always the option of the larger chain store. I also have a great collection of e-books on my iPad in the Kindle app. 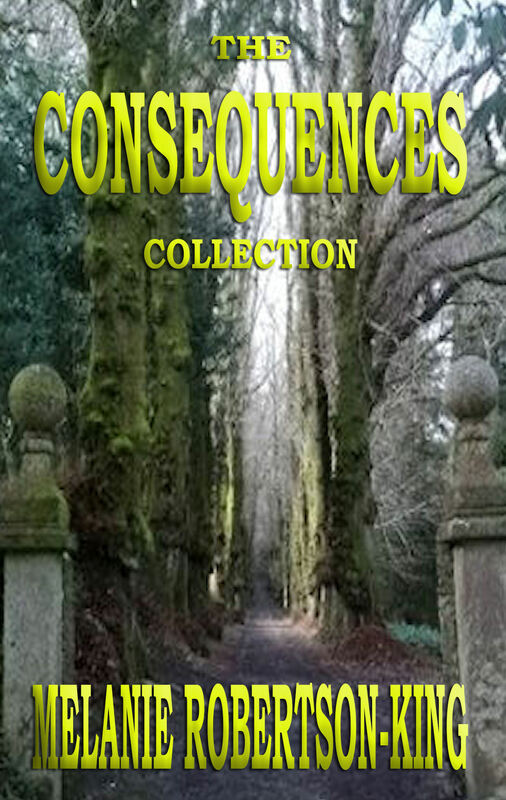 The Consequences Collection – an eclectic compilation of twelve stories ranging from non-fiction through creative non-fiction to pure fiction, in prose and poetry. For Tim Frost, Christmas 2011 is a washout. No Santa. No presents. Nothing. His father lost his job when the mill closed and now the family is on the verge of losing their home. A chance encounter with Nick Kringle, a modern-day Santa Claus teaches Tim that the greatest gift you receive is the gift of giving. is an eclectic compilation of twelve stories ranging from non-fiction through creative non-fiction to pure fiction, in prose and poetry. … no matter where you’re going – business, pleasure – organization is the key. 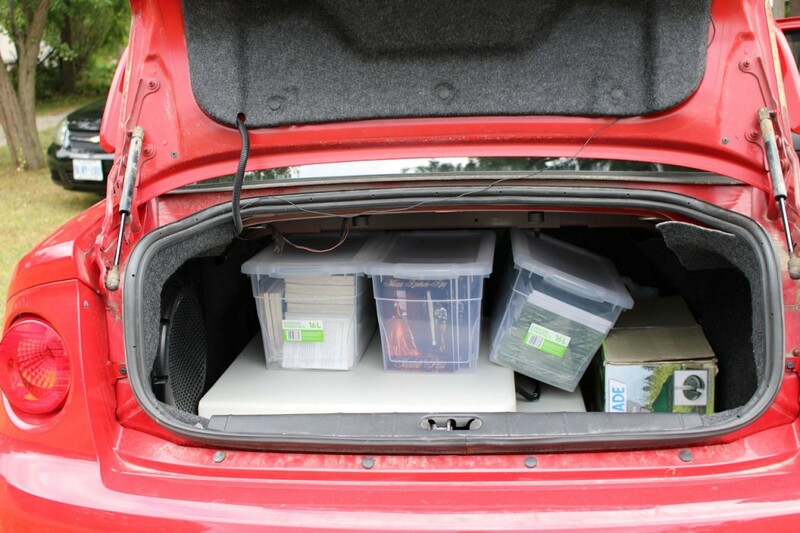 It’s taken us the better part of the summer to come up with the way to pack the car so that everything fits in for our assorted “goods and chattels” that we haul to and from outdoor events. 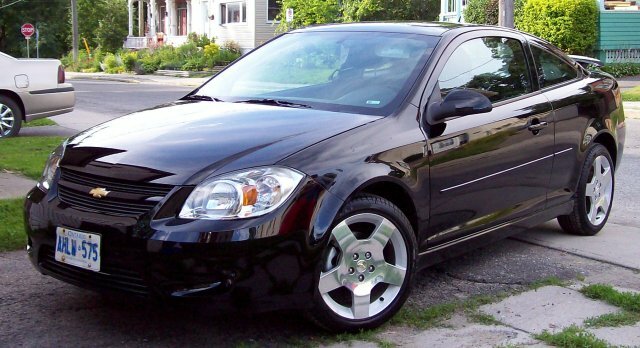 If not Black Beauty (pictured above), it’s the older sibling “Big Red” a 2006 version of the same car – 2-door Chevy Cobalt – that we use to go to the markets. Other vendors have told me, they can’t believe how much I can get in to such a small space. 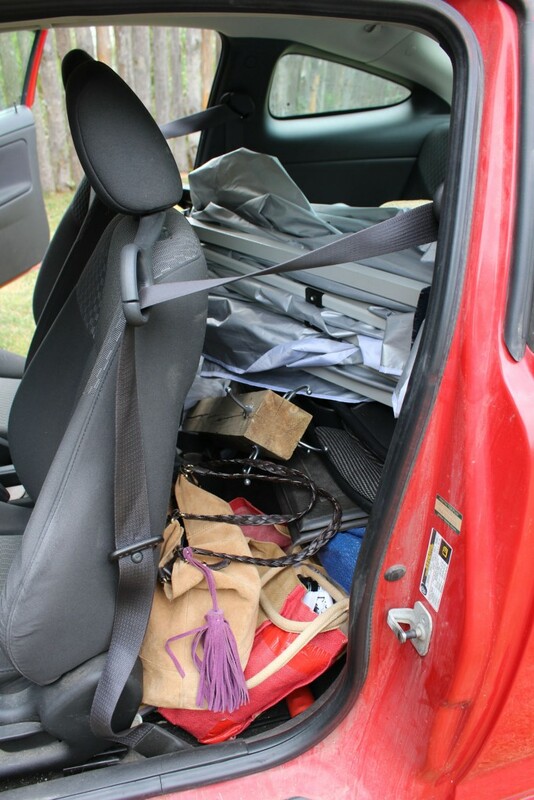 I say the vehicle is just like Mary Poppins’ magic carpet bag. This past Sunday when we loaded up to come home from the Mallorytown Country Market, I documented each step in the process. And yes, we used Big Red. It’s home every day and can be kept partially loaded during the week as I use Black Beauty for my work commute. 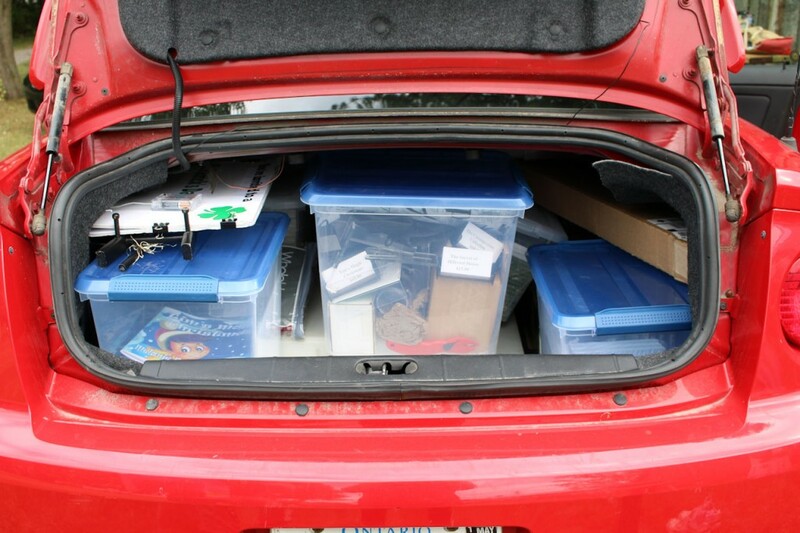 And, hubby is retired so he came up with a way that he can get all the assorted accoutrements to fit in the trunk (boot) of this one. First in, the two boxes of canopy weights. They look much better than bags of bricks, water bottles, and any other heavy object you can anchor yourself down with. (The bottle of windshield washer fluid is a permanent fixture.) Setting up and tearing down does create some mess… dried dirt from parking lots (car parks) and bits of dried grass and leaves from natural settings. First in is the folded six-foot table. Followed by the smaller four-foot one. I know you’re thinking, why not put it in with the handle where you can reach it. We’ve tried turning it the 90 degrees and the rest of the stuff just doesn’t fit. Followed by the table clothes and two of the larger totes. Keep watching… it gets better. Add another tote of promotional material, containing postcards, business cards, bookmarks and my assorted easels and business card holders for price tags etc., (even some WD40 for when the canopy gets a bit stiff)… but we’re not done yet. 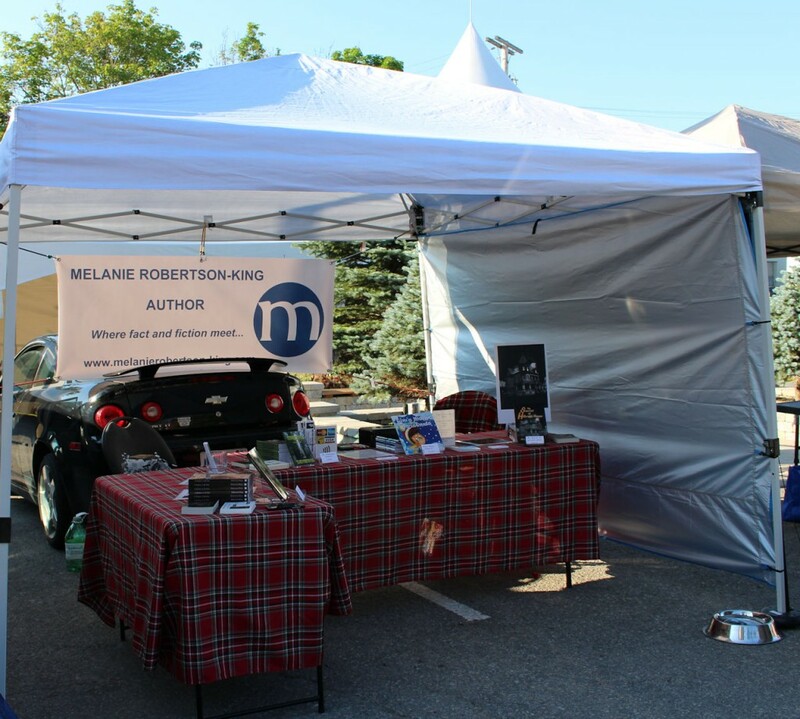 My author banner is tucked in there nicely on one side and so is my illuminated Secret of Hillcrest House sign. 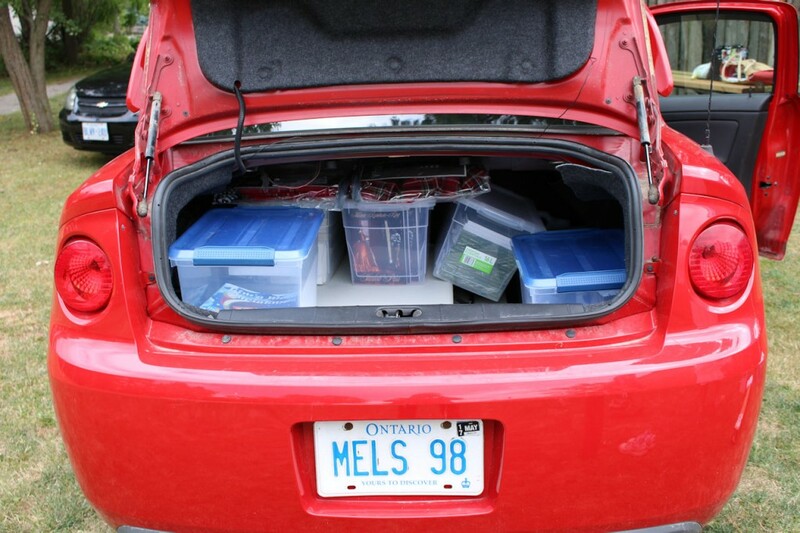 Add the box of tools (screwdrivers, lock nut remover for the wheels, and other assorted goods and sundries, most importantly the cash box) and that’s the trunk packed. Pretty amazing, eh? 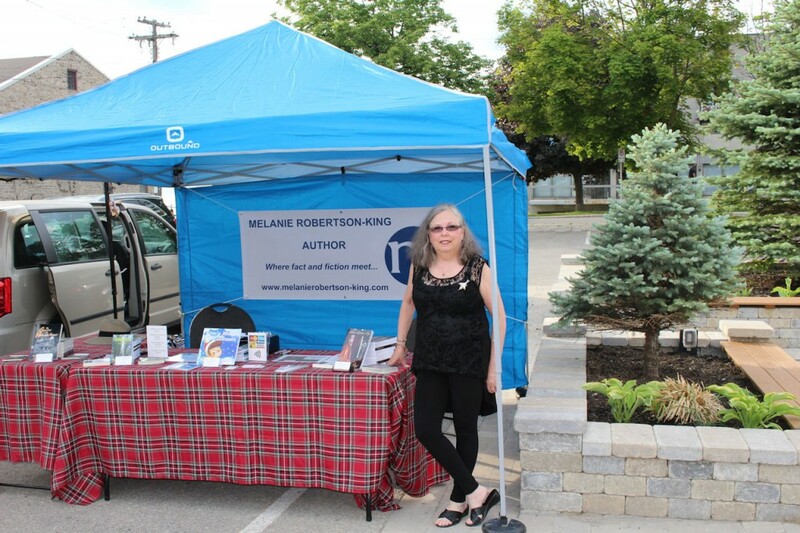 There’s a folded tarp, and one of the white side panels for my “Wonderful White” canopy, my lovely squishy, anti-fatigue mats for venues on pavement, and two folding chairs. This past Sunday, there was even room for a bag of corn on the cob and my track shoes (after Saturday’s rain, I wanted to be prepared for wet grass). 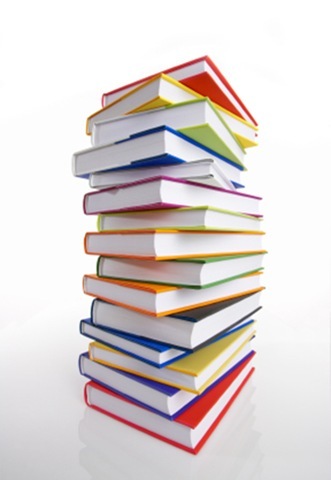 Today is Book Lovers Day! 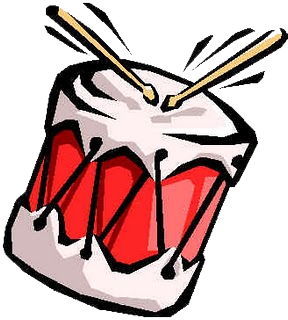 This unique holiday can also be celebrated on the first Saturday in November. So why not celebrate it both days? Hardcover, paperback, ebook. What’s your preference? Both have their advantages. 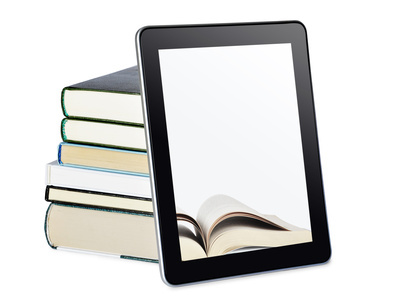 Ebooks are usually less expensive than a paperback and definitely more so than a hardcover. One hundred books on an e-reader weigh far less than the same number of physical books and take up a lot less space – better for travel. Nineteen year old Sarah Shand finds herself in Victorian Era Aberdeenshire, Scotland and has no idea how she got there. Her last memory is of being at the stone circle on the family farm in the year 2010. Despite having difficulty coming to terms with her situation, Sarah quickly learns she must keep her true identity a secret. Still, she feels stifled by the Victorians’ confining social practices, including arranged marriages between wealthy and influential families, and confronts them head on then suffers the consequences. Buy links for A Shadow in the Past can be found here. Tim’s Magic Christmas is currently only available in paperback. To find out how to get your copy, contact me via email. Watch for it coming in kindle and epub formats. My first month at the market (not even a full month – only 3 Saturdays) was a success so I looked forward to June 2016 and what it would bring. June 4 – our first outing with the tent we had to buy after the previous weekend when the one corner jammed… Back-up Blue I call this one. Not nearly as sturdy as “Wonderful White” but at least all 4 legs work and this one has a side panel. I love the spots on this side of the market where you can drive through. 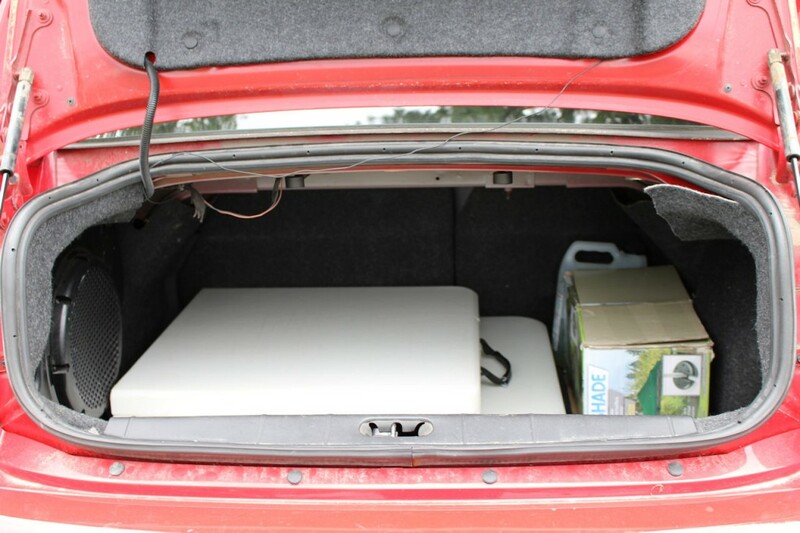 The vehicle is handy and all of the totes I cart stuff to and fro in can be stowed in the trunk and out of sight rather than have them on the pavement under the table. When the panel is on the back side of the tent, I have to lock the car because I can’t see it, but I keep my keys on one of the hooks on my bag tree so if needs must, I can get into the car as and when. So on this Saturday, I sold 1 copy of Tim’s Magic Christmas, 1 copy of The Secret of Hillcrest House and 2 copies of A Shadow in the Past. 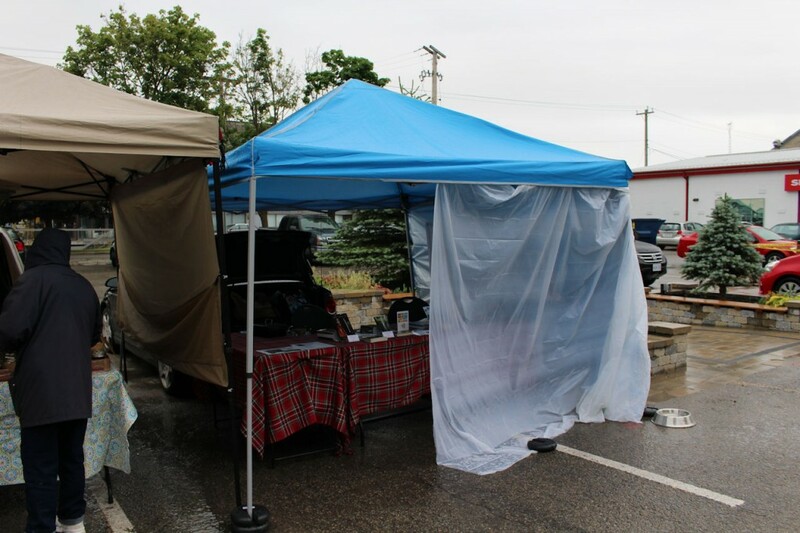 June 11 – This Saturday was an exercise in creative ways to keep dry. It was cloudy when we unloaded and set up (you’ll notice the panel is on the side not the back this week). Unfortunately, about an hour later, the rains came down. Tables pulled further into the tent. Plastic drop sheet over the tables and books. Then the rain stopped so the drop cloth came off – wet and dirty around the edges. If the rain didn’t start up again shortly after that. 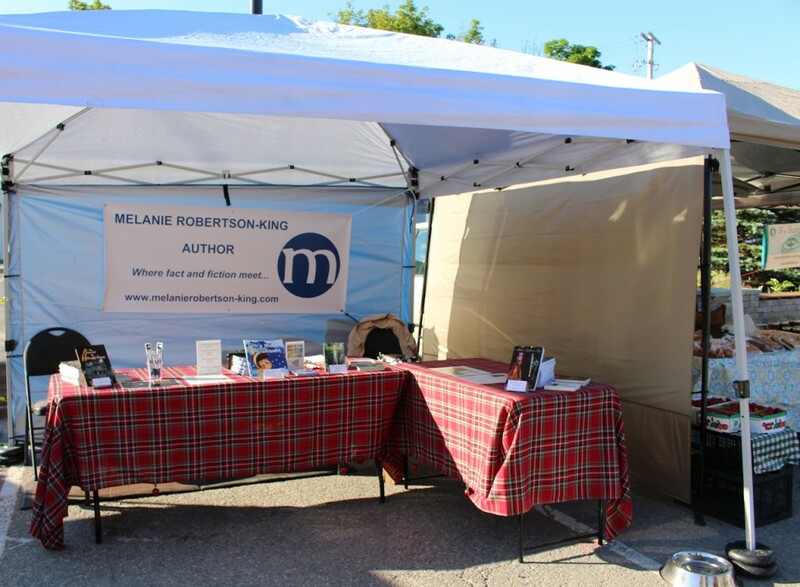 Well, I couldn’t put a wet, dirty drop cloth over the books so I moved all of them to one end of the table and hung the drop cloth from the canopy leaving a “doorway” into the tent so people could still come in and browse. It kept the books dry which was the main thing. Because of the bad weather there weren’t many people out and about. I had also said that I wouldn’t be there if it rained but when it wasn’t when we left the house and didn’t start until later, I was committed. At least the rain stopped when it was time to tear down and call it a day. 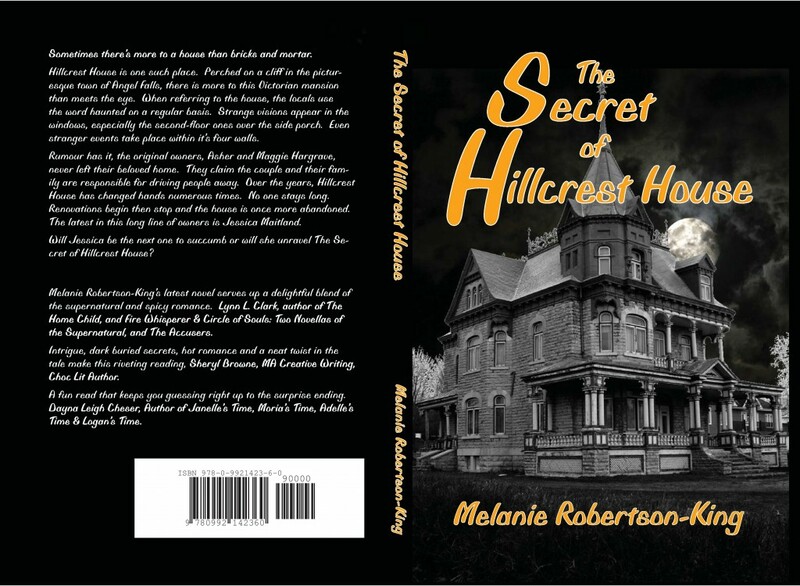 I sold 1 copy of The Secret of Hillcrest House but like I said, no one was out and about. Even the vendors were few and far between. June 18 – Wonderful White was back in service this week. The parts we ordered had come in and she was reassembled. The drive-through spots were few and far between thanks to construction in the parking lot but, I managed to get a spot on the side I like. It meant unloading then moving the car and backing into the spot behind the tent but that’s a minor detail in the grand scheme of things. I used the side panel from “Backup Blue” and put it silver side in and tried a different layout with my tables. Still an L shape but a more inviting one … I think so anyway. I didn’t have my hat this week so tried to stay under the canopy where it was shaded rather than out and about in the sun. 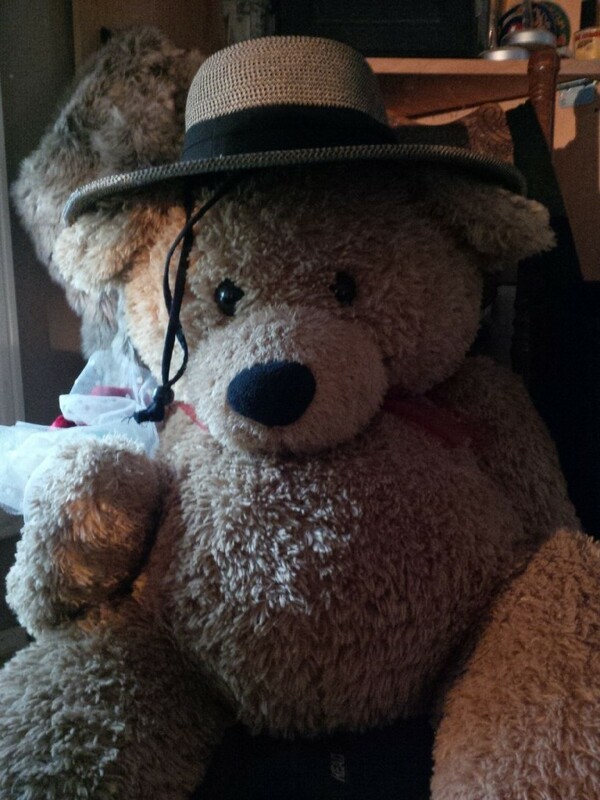 My story is the bear wouldn’t give it back to me. She’s my hat rack, you see … LOL! 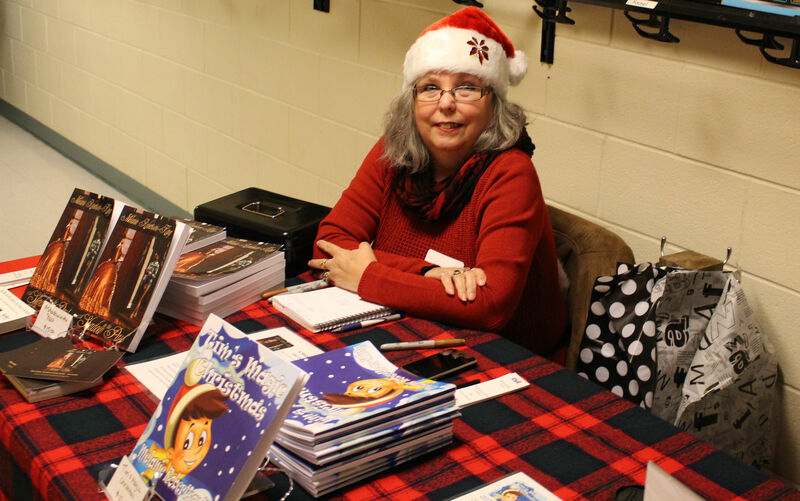 When the day was over, I sold 1 copy of Tim’s Magic Christmas, 1 copy of The Secret of Hillcrest House and 1 copy of A Shadow in the Past. 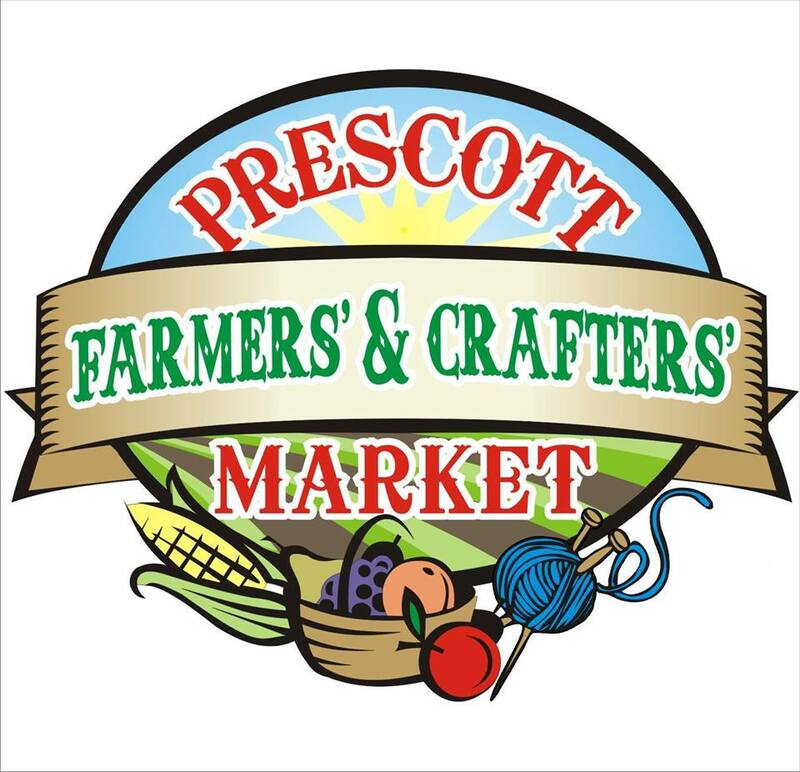 June 25 – This week there was some big ‘do’ going on in the parking lot for the town of Prescott so it was a bit crowded. Still got my drive through parking space but the back end of the car shared space under the canopy. The back half of the parking lot was roped off, a huge marquis set up and stacks and stacks of tables and chairs. There were even two porta-potties and a hand wash station but they weren’t there for the benefit of the market vendors. They were brought in for the party later. But that doesn’t mean we didn’t use them. Table still laid out in the inverted L this week and the panel up on the side. I brought my poster board for Hillcrest House with the cut out windows and lights but ended up having to take it down because it was just windy enough that the foam core board kept blowing over. 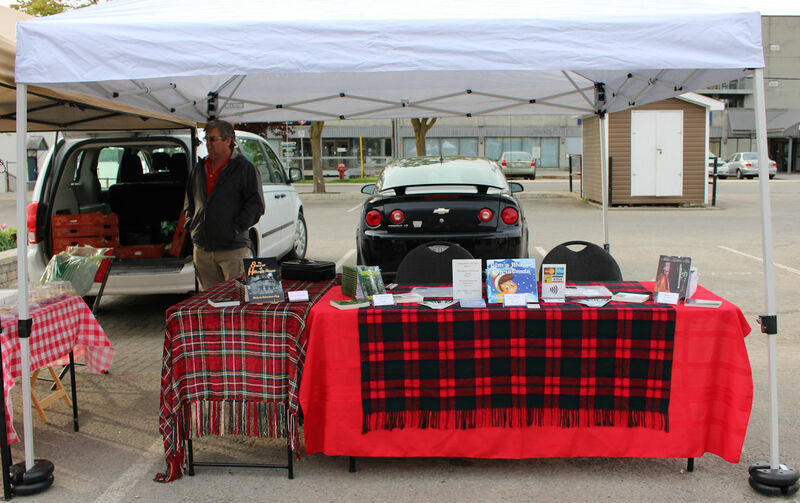 Even while the market was still going on, the volunteers had arrived and started setting up tables. One by one as the vendors left, their stalls were filled with tables! Being a stubborn sort (I hear you gasp in surprise), I decided when it was time to tear down, I was going to go as slooooooowly as possible. And so I did. 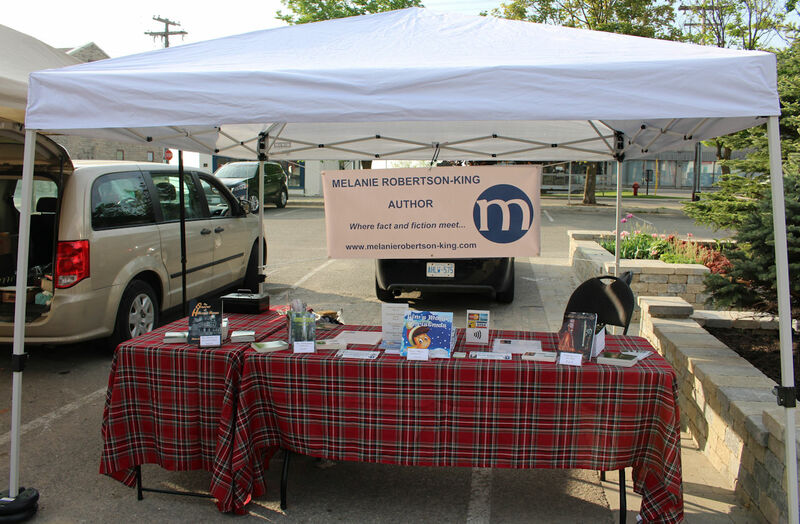 Tables, chairs and another tent were set up around my stall. When everything was packed and loaded, I had to back under the tent they had set up in front of the centre court to get out of the parking lot. When all was said and done, I sold 1 copy of The Consequences Collection, 1 copy of The Secret of Hillcrest House and 1 copy of A Shadow in the Past. I’m looking forward to July and August to see what they will bring! After only having done the market once in 2015 (invited by a friend for Christmas in July), and having fun at the event, I decided to contact the “head honcho”, “grand poobah”, “big cheese” about becoming a regular this year for at least the Saturdays when I’m not already committed elsewhere or it’s not raining. 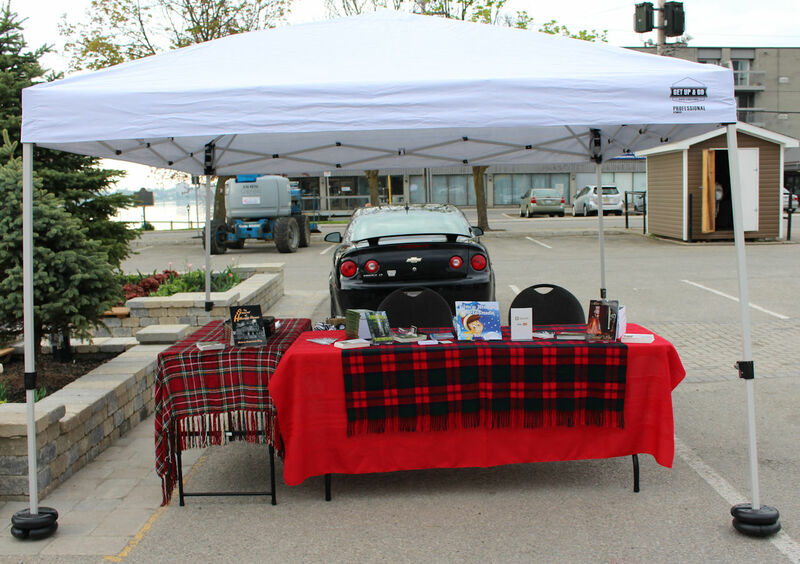 Even with a canopy, books and rain don’t mix. 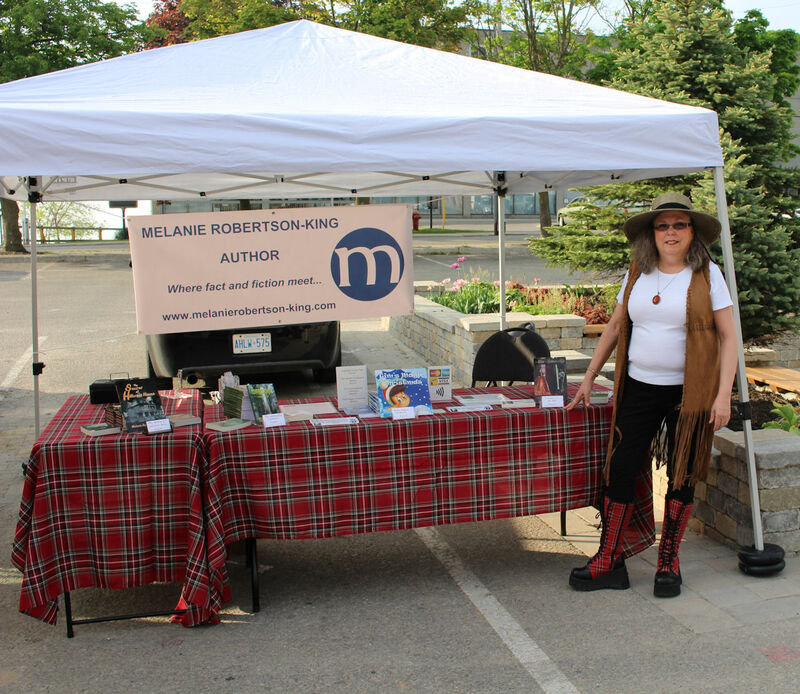 The first Saturday I went was the grand opening of the market for the season – May 14th. I swear my car is like Mary Poppins’s carpet bag. 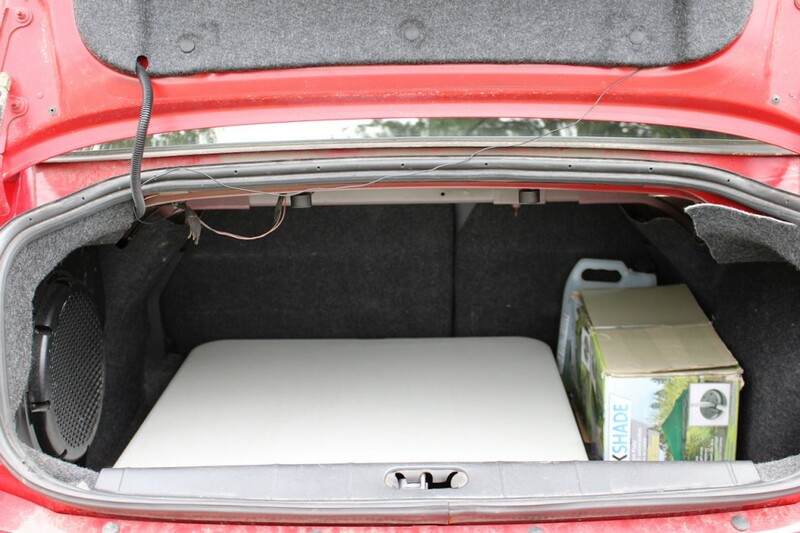 You pop the trunk and more and more stuff keeps coming out – plastic totes of books and accessories, weights for the canopy legs, tables. 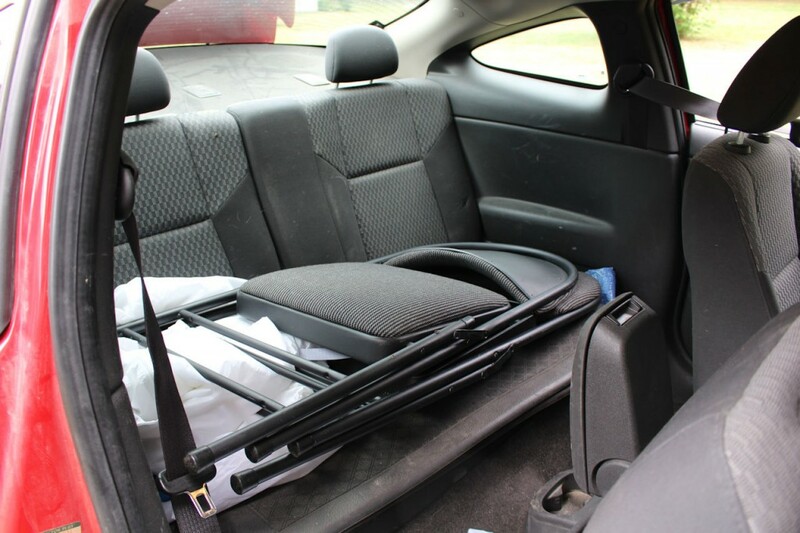 And then there’s the canopy that rides cross-ways in the back seat along with the chairs. 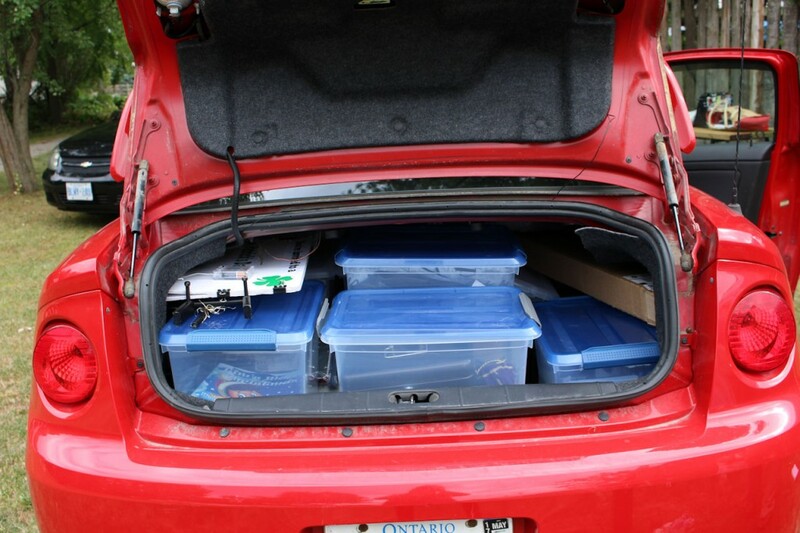 See why I refer to my car as a magic carpet bag? 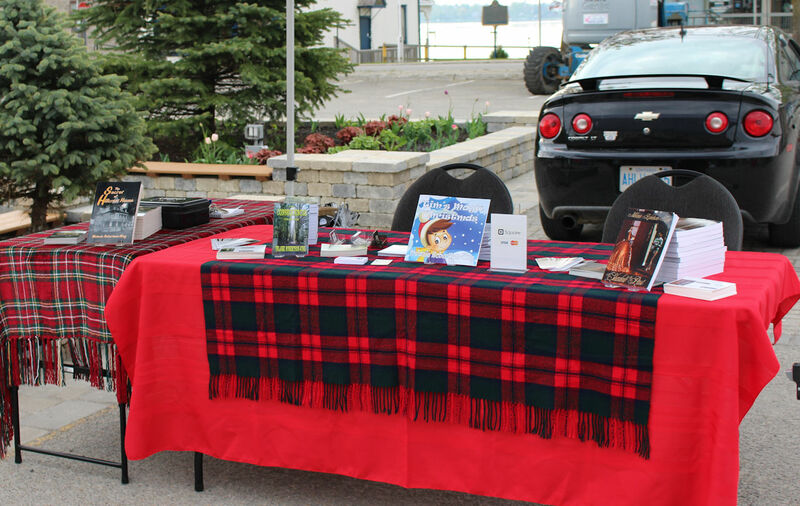 The tartan cover on the table to the left is the one hubby scored in the silent auction at the Friendly Circle Showcase in Long Sault on May 7th. It’s very pretty and if a body had to wrap up in it on a chilly morning, it would be lovely and warm. One small problem tho’ when it’s on the table and there are books and what-not on it… I’ve not quite mastered yanking a table covering out from under what’s on the surface without disturbing things… LOL! 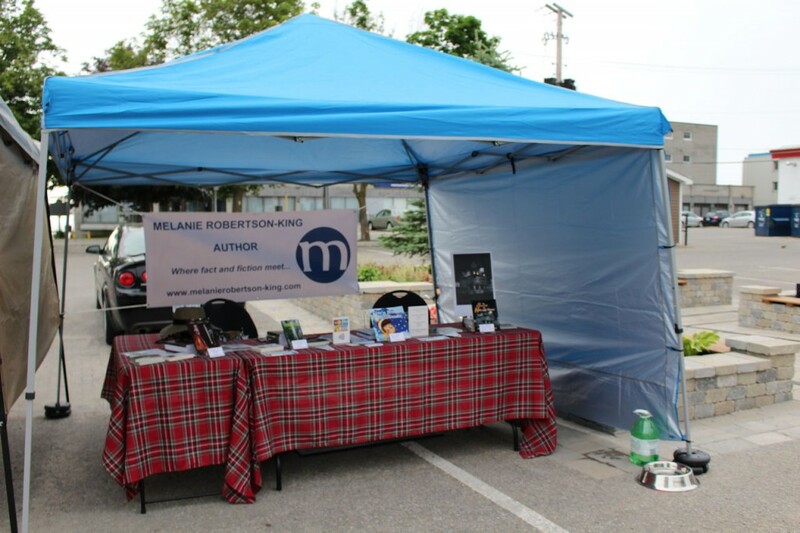 So, on my first outing I sold 1 copy of The Secret of Hillcrest House. I only sold a single book at Christmas in July the previous year so I wasn’t disappointed. It’s fun. 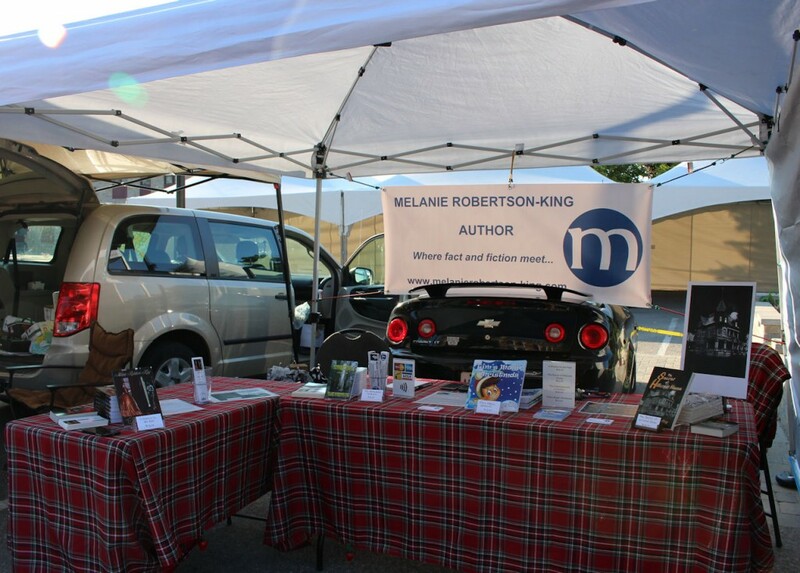 It’s social and selling books is a bonus. Mind you, I’d be happy making back the 2016 registration fee. 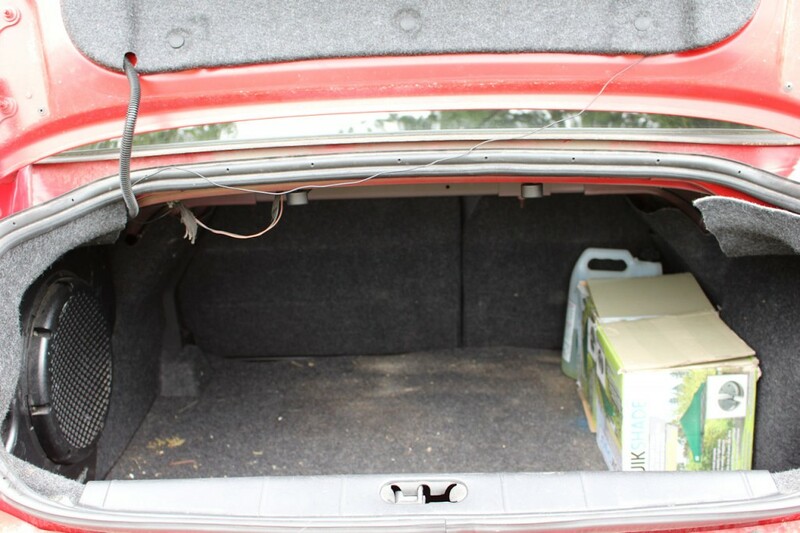 Things picked up the following Saturday – May 21st. I didn’t get the same drive-through stall as the previous week but got the one next to it. I love these spots! 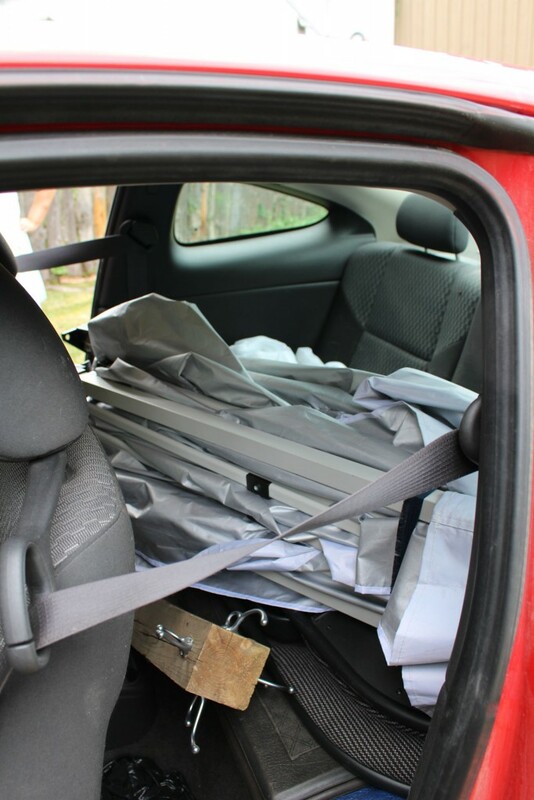 They’re so handy for unloading and setting up… and tearing down at the end of the day. People seemed glad to see I was back (and not just a flash in the pan). And more asked if I would be there all summer. By the time this event came around, I had my bluetooth debit/credit card reader. I don’t have enough fingers to count the number of times I’ve heard ‘if you only took debit’. I have a Square but here in Canada it’s only credit card transactions – and it saved me a few otherwise lost sales over the years. 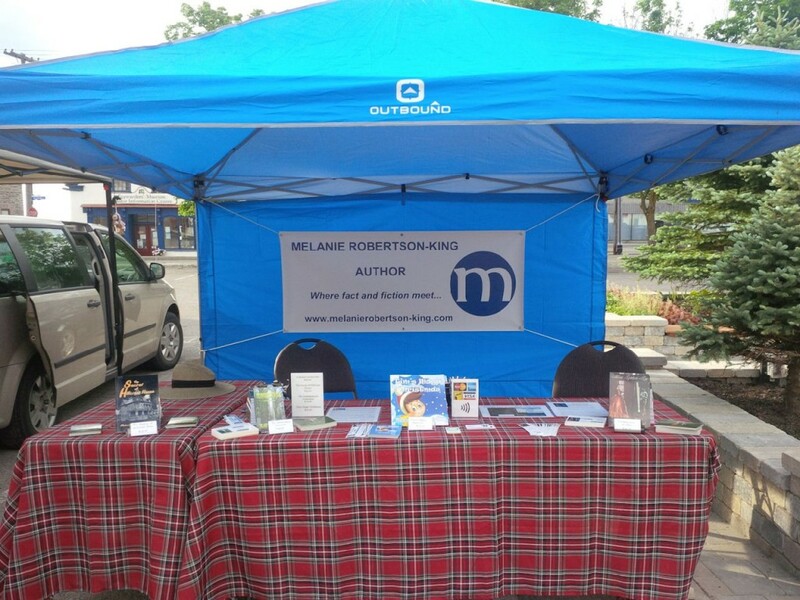 So this second week at the market, I sold 1 copy of The Secret of Hillcrest House, 1 copy of The Consequences Collection, and 1 copy of Tim’s Magic Christmas. In the first two weeks of being a regular vendor, I made back the cost of the annual registration. Happy girl!!! Moving along to the last Saturday in May – May 28th. Construction work on the light standards in the parking lot meant the loss of a minimum of 4 stalls. But as they’re on a first-come, first-serve basis, I still managed to get one of my drive-through ones. 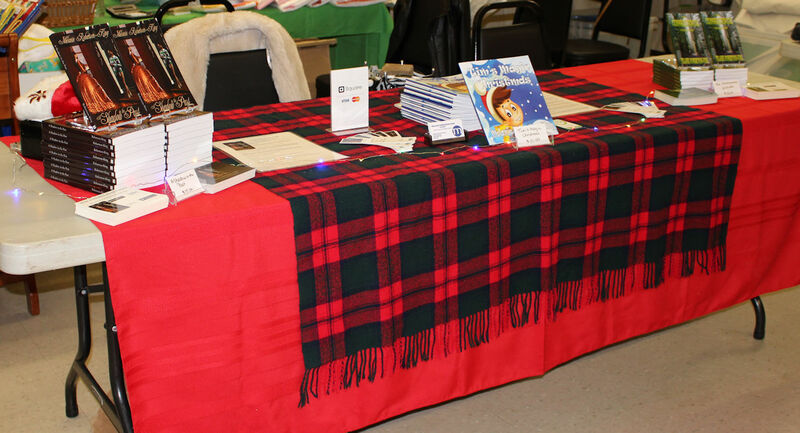 By now the banner I had created at Vistaprint (a cross between my website header and my business card), my new bookmarks (more like the website in that my picture is on them) and my matching tartan tablecloths had arrived. This was a good day, albeit a scorcher. My boots almost match the tablecloths. I wearing the vest bought along with the long one (mid to lower calf length) that I wore at the Long Sault event. Sales were event better on this day. 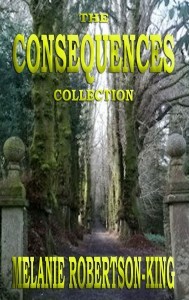 I sold 2 copies of The Consequences Collection and 2 copies of A Shadow in the Past. So I made my registration fee twice over now! Woot! And I’ve still not used my debit/credit card reader. The only downer on the day was when we attempted to take down the canopy, the left front corner wouldn’t come down for love nor money. But with help from the vendor next to us, a screwdriver and hammer from another across the way and a Swiss army stocking stuffer, we managed to get the blasted thing down and packed into the car. Now to source just the parts we need for it. Only used 6 times and the plastic centre post cap is twisted as are some of the plastic parts in the roof braces. Bought another one the following day – less money and comes with a side curtain. We’ll see how much better (if any) it performs. Surely, we’ll get six uses out it. The old one is currently relegated to home use where it doesn’t matter if it doesn’t want to fold down – everything we need is at hand. Fingers crossed that all the Saturdays in June give us good weather even though we need rain desperately. Overnight and Monday to Friday are my choices, although I don’t have a lot of say in the matter. The new show season has arrived! 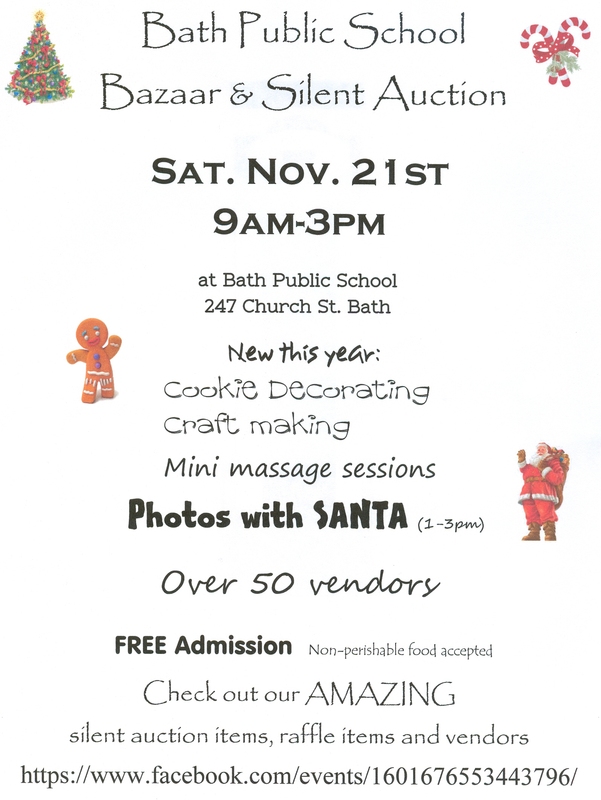 It’s been some time since I’ve done an event. 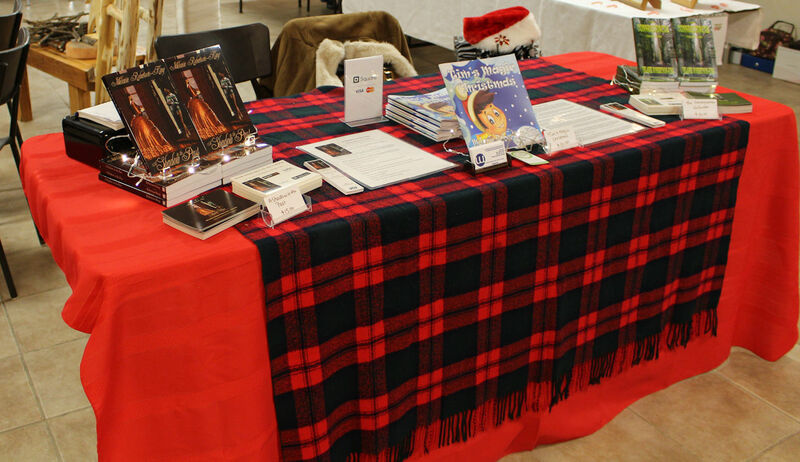 A bit rusty getting the tartan throw centered on the table. That coupled with having 4 books to display added to the confusion. The sign I had for A Shadow in the Past got damaged in transit last year so I have to create a new one. I’m looking at getting a banner made for it and getting the stand to put it in. I have an easel and that’s fine but it does take up a lot of space. So, the new book – The Secret of Hillcrest House – is on the end at the right in the picture. It was quite bright in the hall, but the picture mounted on foam board behind the books has the windows in the attic cut out and battery-operated LED lights behind them. The new clothes. I bought the long ‘suede’ vest (as well as a short fringed one) and the white sweater from simons.ca. Ever since being in their store on a trip to Quebec City, I fell in love with their clothing. The only drawback with the long vest is static cling. And when a body walked, the fringes wrapped around the legs. That’s just a minor detail. The tartan boots were brought out of retirement from last year. 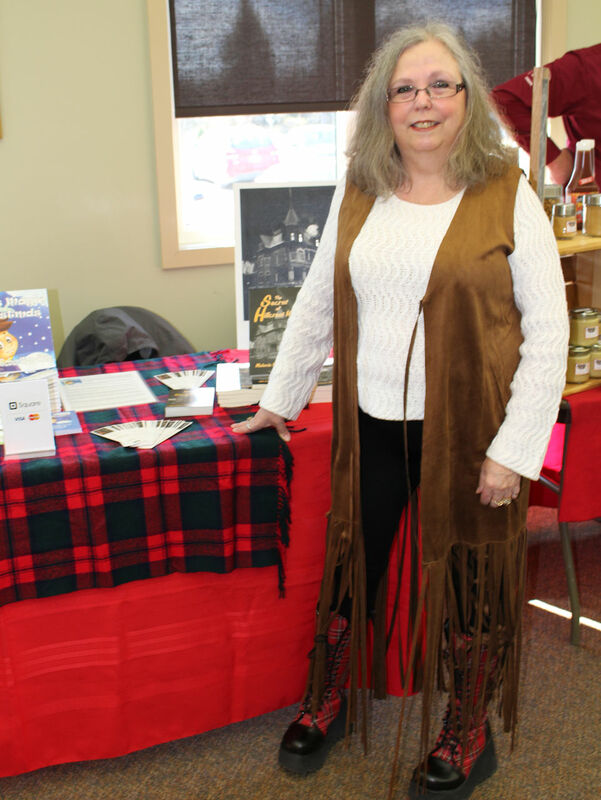 While sales at the Friendly Circle Showcase on Saturday were slow, it was fun to see everyone again and make plans for other events later on in the year. So a recap of the day. 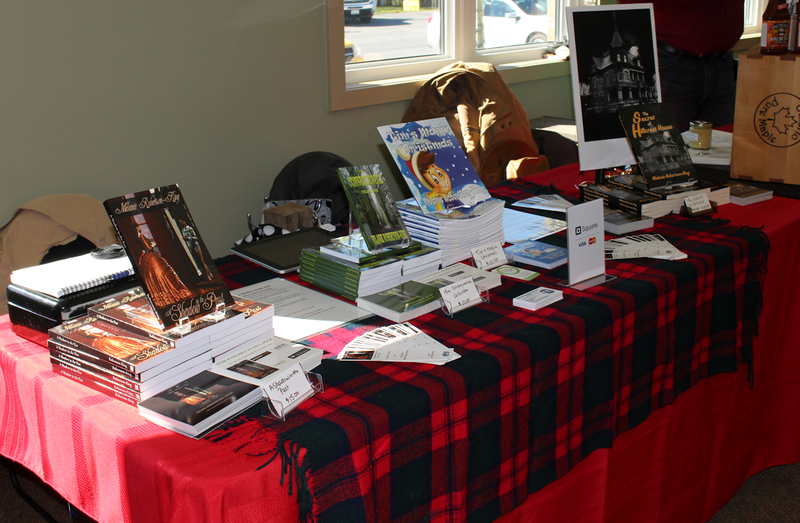 I only sold 2 copies of The Secret of Hillcrest House. When I went through my spiel, I described it as supernatural with ‘spicy’ romance. One of the women said my comment made her giggle. 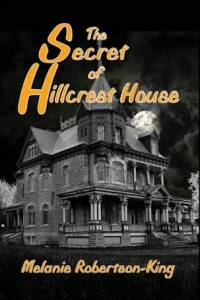 Before Saturday’s show, I had sold 14 paperbacks of The Secret of Hillcrest House and 10 kindle copies. 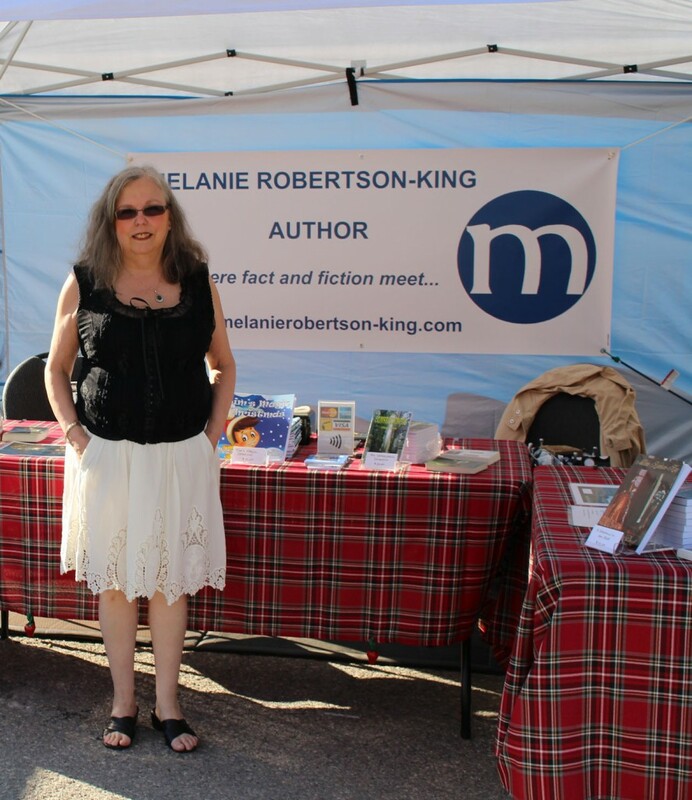 If you want to find out more about any of my books, you can find them on my website’s books page. 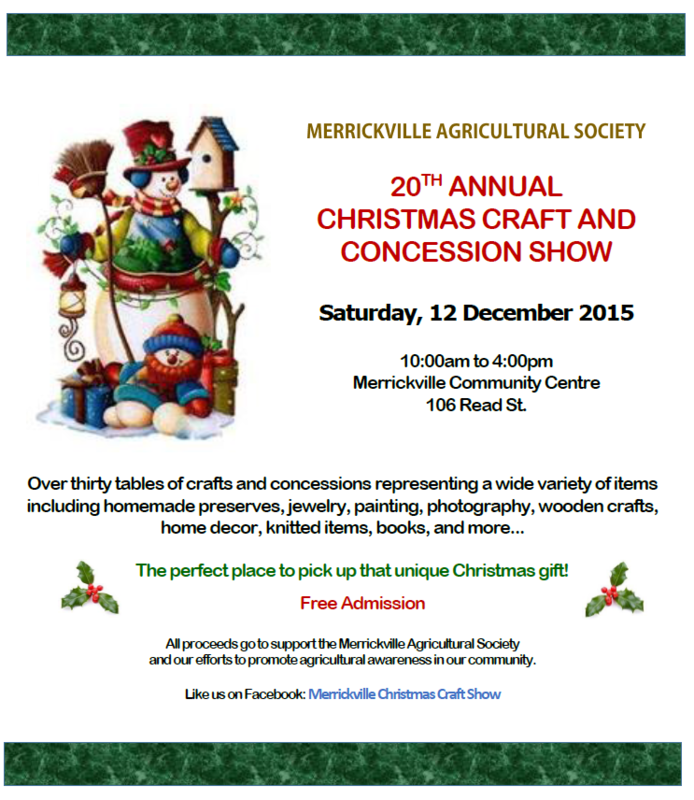 The Merrickville Christmas Craft and Concession Show marked the end of the 2015 season, well for me anyway. There could be others this weekend or next but I’m so far behind in everything, I think I’m ahead… I’m not exaggerating. My display with multi-coloured battery operated LED lights to make it look festive. This was my last event of the 2015 season. It’s hard to believe it’s less than two weeks before Christmas. Yikes! Where has the year gone? It was a good day on the sales front for me starting before the official opening time of the show when I sold 1 copy of A Shadow in the Past. Before the day was finished, I added sales of 1 copy of The Consequences Collection, and 4 copies of Tim’s Magic Christmas. I’m looking forward to the 2016 season and hope to attend even more events next year. It’s been ages since I’ve been to Lanark. I’ve been close twice this year when I did shows at McDonalds Corners but never quite made it here. Christmas on the Clyde has a nice ring to it, don’t you think? The Civitan Club isn’t right in Lanark but just on the outskirts. Lovely big hall and my table was front and centre as people came in the door. I thought that would be the perfect place and I’d sell books hand over fist. Nice thought… but it didn’t quite turn out that way. I had asked for a place where I could set up my easel and not affect foot traffic. The way the hall was set up, it worked perfectly. 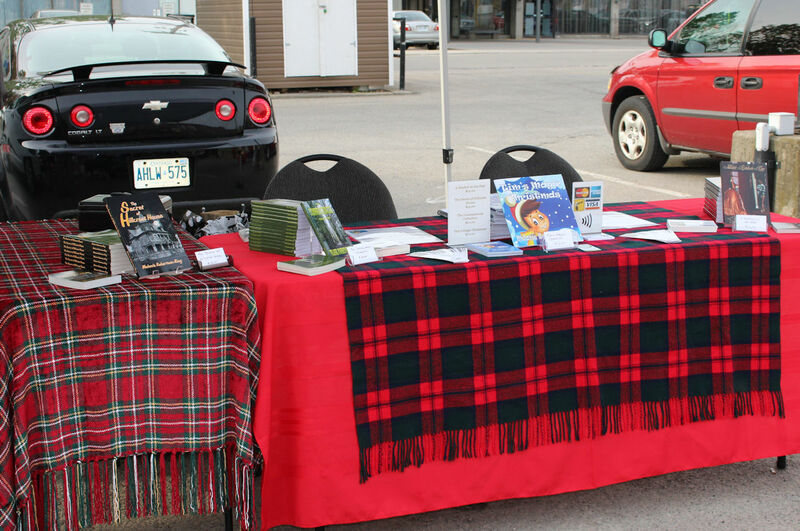 Still, I met lots of interesting people and sold some books. Gotta like that part of it. 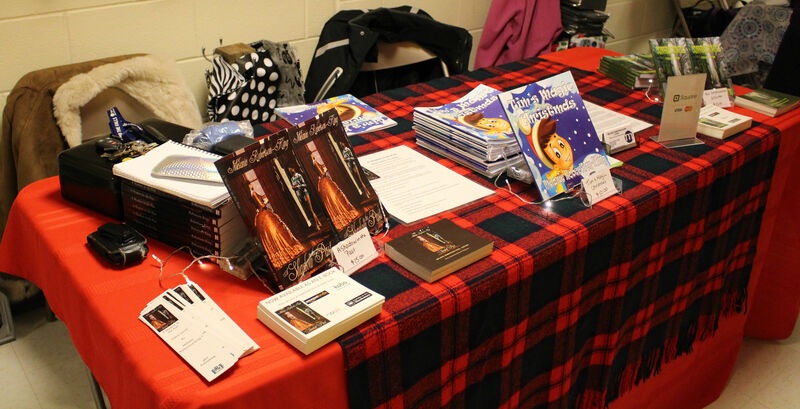 By the end of the day, I sold 2 copies of Tim’s Magic Christmas and 1 copy of The Consequences Collection – the woman who bought it didn’t have enough cash with her in the morning and made a point of coming back in the afternoon before the sale ended so she could snag a copy for herself. I’ll be back again next year… that is, if they’ll have me. 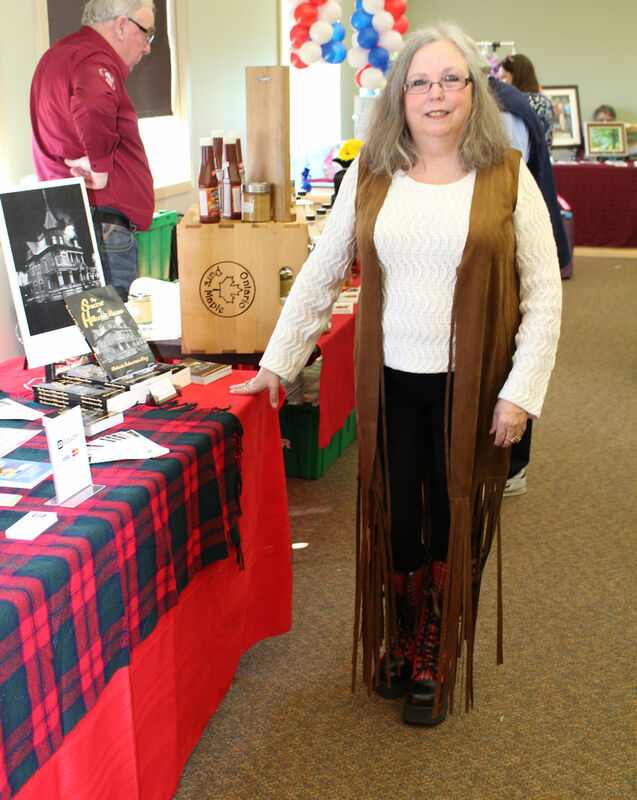 Yesterday, I took part in the craft show at the Mallorytown Legion. It was slow on the sales front despite plenty of foot traffic. But that’s to be expected when there are two other events taking place on the same day. Still, it was fun to connect with vendors and customers I’ve not seen since the last time I did this show (2 years ago). When it was all over (but the crying – not really), I sold 2 copies of Tim’s Magic Christmas and 1 copy of A Shadow in the Past which is going to be in-flight reading on a trip to BC. My girl, Sarah, really gets around, she does. 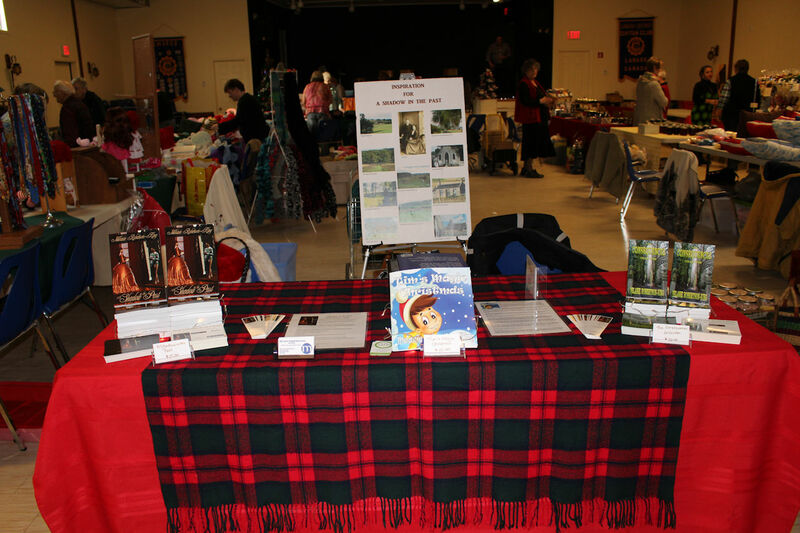 Next Saturday I’m off to Lanark for the Civitan Club’s show. Maybe I’ll see you there? It was a great day in Bath yesterday. Cozy in the primary hall but lots of foot traffic nonetheless. Because of the width of the hall, it was difficult to get a good picture of my display. Some of the things that are visible in this photo are usually hidden by the magic of camera angles. Another thing with it being so cozy was anything close to the edge of the table had to be constantly straightened up. But that’s a minor detail. I did get lots of compliments on my display which is always music to my ears. 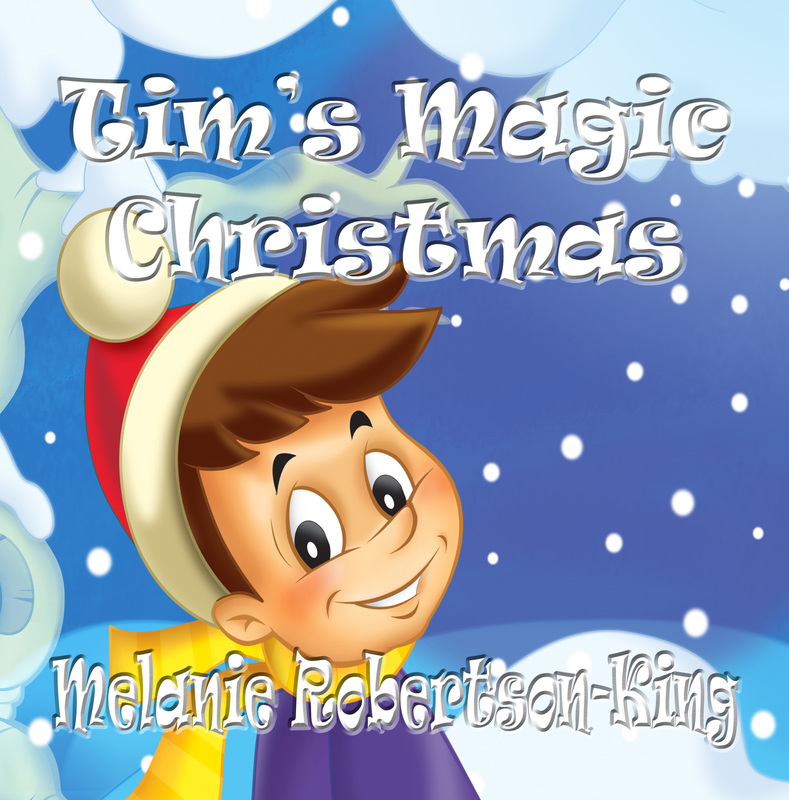 I sold 7 copies of A Shadow in the Past and 7 copies of Tim’s Magic Christmas! One of the sales of Tim was using my Square credit card reader. We weren’t to pack up until after 3:00 and if we did, we wouldn’t be invited back next year. I couldn’t have packed up at that time if I tried. I still had customers at 3:00. One was a young man who stood quietly in front of the table so as not to interrupt the woman who was buying a copy of A Shadow in the Past at the time. He was very polite and asked a lot of questions about writing and publishing a book and wanted to know if he could buy a copy of Tim’s Magic Christmas. This young man was in the target age group for the book (his mum was at the table beside me) so with money he got from his parents and grandparents, he bought the book which I gladly signed for him. I’ll be back in Bath next year and I hope I run into this polite young man again. I’d love to know what he thought of Tim’s Magic Christmas. Oh, and I even managed to stay on track writing every day for #NaNoWriMo. It was longhand and I didn’t get it typed up until this morning but I managed 316 words.